(January 29, 2019) Public Media Women in Leadership (PMWL) announces the launch of facilitated peer group communities. These groups will feature intimate conversations around topics such as job verticals (development, investigative journalists, digital staff, etc.) and leadership (confidence building, managing change, etc.). The goal is to create an immersive experience for women within public media to openly share their experiences and acquire support in a confidential setting. The meetings are scheduled to take place via videoconference on a monthly basis for six months. Those interested in participating can sign up via the organization’s Google Form: http://bit.ly/PeerGroupSignUp. Signed up individuals will receive an email confirmation with more details regarding their status as well as more information regarding the schedule and how to meet with peers using PMWL’s video conferencing platform. For more information visit publicmediawomeninleadership.org or contact PMWL at pmwomeninleadership@gmail.com. The Public Media Women in Leadership organization was founded in January 2015 by Deanna Mackey and Jeannie Ericson to provide a forum for women leaders and aspiring leaders to support and learn from each other, provide training and mentorship opportunities, build community and advocate for women leadership within public media. The PMWL currently has 2,000 active members in its Facebook Group and provides bi-monthly training webinars on both public media and leadership topics and leads sessions and socials at many public media national conferences. The PMWL is supported by a committee of current and retired women leaders in public media, many who joined as the organization was founded. The Wyncote Foundation is the generous sponsor of the PMWL’s grant to fund the Mentoring & Engagement Initiative. (October 15, 2018) Public Media Women in Leadership (PMWL) announces the launch of the PMWL Mentoring and Engagement Program, the first of its kind to cater to the varying needs of women in the industry through one-on-one mentoring partnerships. Funding for the program is provided by the Wyncote Foundation whose mission is “to support efforts that strengthen and enrich culture, community and the natural environment.” The Foundation has been active in supporting public media projects for many years ranging from system innovation to journalism and independent film. Participation in the program will include monthly calls/meetings with a mentor. Curriculum and recommended topics of discussion will be provided while also allowing mentor/mentee partners freedom to dictate their own topics for discussion if preferred. The platform, built on state-of-the-art mentor management software, includes a plethora of resources created by PMWL to further support program participants. Potential mentors and mentees can sign up at pmwlmentoring.chronus.com. During this phase, applicants will be asked to fill out a profile form. Once accepted into the program, mentors and mentees will be able to start forming mentoring connections. Applying to the program is easy and straight forward. Questions: Please contact PMWL’s Mentorship and Engagement Coordinator, Veronica Varela Reyes, at varelareyes.vr@gmail.com. The Public Media Women in Leadership organization was founded in January 2015 by Deanna Mackey and Jeannie Ericson to provide a forum for women leaders and aspiring leaders to support and learn from each other, provide training and mentorship opportunities, build community and advocate for women leadership within public media. The PMWL currently has more than 1,900 active members in its Facebook Group and provides bi-monthly training webinars on both public media and leadership topics and leads sessions and socials at many national public media conferences. While Ericson has left public media, Mackey currently serves as president of the Public Television Major Market Group. Mackey is supported by a committee of current and retired women leaders in public media, many who joined as the organization was founded. The grant to fund the Mentoring & Engagement Initiative is being provided to the PTMMG on behalf of the Public Media Women in Leadership organization. The Wyncote Foundation's mission is to support efforts that strengthen and enrich culture, community and the natural environment. The Foundation, based in Philadelphia, was founded in 2009 with funds from the Otto and Phoebe Haas Charitable Trusts, at the direction of John C. Haas. It is named after the town Wyncote, located in Pennsylvania, where John C. Haas and his wife, Chara, owned their first home and raised their family. (October 8, 2018) Public Media Women in Leadership (PMWL) announces the launch of Advance, a program created to provide members an engaging learning experience in webinar format. 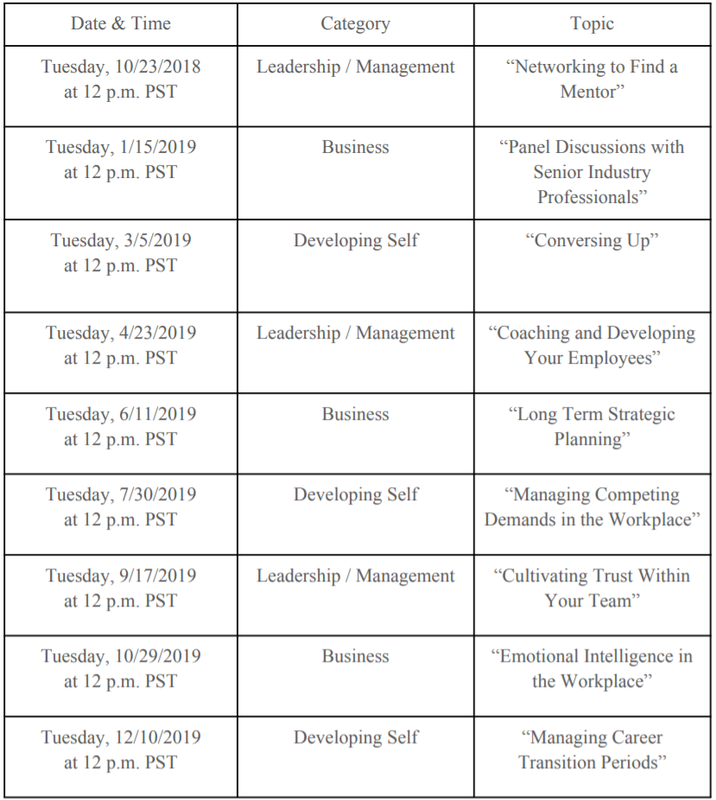 Webinars will encompass topics from three categories identified as crucial to women’s leadership success: Business, Developing Self and Leadership / Management. Program participants will have the opportunity to earn a certificate of completion to showcase their involvement and willingness to improve upon a skill set. With the goal of increasing engagement, webinars will include assignments where members may work toward improving either a hard or soft skill related to the webinar topic. The following calendar provides dates, times, categories and topics for the program. All dates and times are subject to change. Those interested in participating in the program are to sign up via the organization’s Google Form: http://bit.ly/AdvanceProgramSignUp. People who sign up to the program will receive all program materials directly to their inbox. Those who do not sign up will still be able to participate in PMWL webinars, but without the added benefits of the program. The Advance Program is part of Public Media Women in Leadership’s Mentorship and Engagement Initiative, a three-year program with the aim to provide one-on-one mentor partnerships for women in public media and developing facilitated peer-group communities around job verticals (development, investigative journalists, digital, etc.) and leadership topics (confidence building, managing change, etc.). For more information on how to sign up to the Advance Program, visit publicmediawomeninleadership.org or contact PMWL at pmwomeninleadership@gmail.com. Want to get involved with PMWL? Take our survey! Would you like to help us learn more about the professional and leadership development needs women in our industry are facing? You can do so in 5 minutes or less. We are excited to announce our newest Mentorship and Engagement Survey for 2018! This survey will help our PMWL committee gain insights on professional and leadership development topics, building our mentorship program curriculum, and creating resources to better serve women in our industry. This survey is part of our PMWL Mentorship and Engagement initiative, a three-year program with the aim to provide one-on-one mentor partnership for women in public media and develop facilitated peer group communities around job verticals (development, investigative journalists, digital, etc.) and leadership topics (confidence building, managing change, etc.). (July 30, 2018) Public Media Women in Leadership (PMWL) has hired its first staff member, Veronica Varela Reyes, to serve as the organization’s inaugural Mentorship & Engagement Coordinator. Veronica holds a Bachelor of Science degree in Business Administration with an emphasis in Marketing from San Diego State University. Her background includes administrative, communications, event coordination, marketing consulting and research experiences. 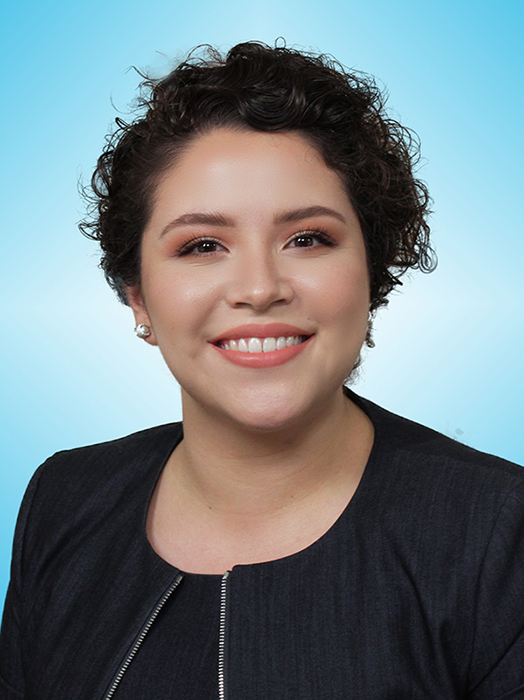 In this new role, Varela Reyes will be the first point of contact for women interested in engaging with PMWL. She will also run the organization’s mentor program, match and facilitate peer groups and manage social media, communications and events in partnership with founder Deanna Martin Mackey. Varela Reyes began her professional career in public media at San Diego’s public media station, KPBS, working with the executive office. Veronica’s commitment to the stations’ mission, vison, and values earned her the Susan & Stephen Weber Education and Community Engagement Fellow award and landed her a temporary role with the GI Film Festival San Diego team. After public media, Veronica continued her career in agency work with an award winning public relations firm, where she expanded upon her social media and blog content curation skills while also managing multiple client accounts and fostering professional relationships with members of the media. Most recently, Veronica has been working on a grant-funded study where she has applied her administrative, marketing, and research skills to coordinate the project, collect and manage data, and oversee a team. Below is Veronica Varela Reyes’ contact information. The PMWL Mentorship & Engagement Coordinator is responsible for managing the organization’s mentor program in partnership and under the guidance of the PMWL founder. This position will help with the organization and implementation of the program including learning to use the mentoring software, setting up questionnaires for mentor/mentee profiles, creating criteria for periodic check in (polls, surveys) of participants, creating entrance and exit surveys. This position will also help recruit both mentors and mentees as well as facilitators for the online peer groups. The coordinator will schedule peer group meetings and do all promotion and follow up with attendees. The coordinator will work with the founder and her committee to plan trainings for mentees and members of the PMWL Facebook group via webinars, regional meetings and sessions at industry conferences. This is an independent contractor position slated for 20 hours per week. It is a three-year agreement based on mutual agreement between the two parties. Build and nurture engagement in the mentorship program with women in the PMWL Facebook group and our national and station-based industry partners. Manage the mentor program and serve as the first point of contact for mentors and mentees. Become well versed in using the mentorship software and create the survey, questionnaires and polls used to assess the partners’ progress. Manage and facilitate creating and implementing the peer groups and provide support for the facilitators with content and logistics. Help plan and execute the PMWL webinars, sessions and socials at regional and national conferences. Administer all paperwork and track all data for the program. Maintain efficient and effective record keeping procedures. Communicate effectively with mentors, mentees, project partners, etc. Model professional and ethical standards. Prefer a background in public media. Demonstrated interest in women leadership and supporting women to attain leadership positions in public media. Self-starter who can fulfill job responsibilities without supervision. This position will likely be remote and will serve women all over the country. Software savvy, comfortable working with new platforms to manage mentor partnerships and videoconferencing. Curious; enjoys troubleshooting & exploring solutions. Likes to continually learn, both mentoring best practices as well as software tricks. Biased toward action; decisive, a fan of iterating & continuous improvement. Does not let perfection stand in the way of momentum. Able to experiment with marketing tactics and plan activities, trainings and events to generate ongoing excitement. Can effectively mobilize resources cross-functionally to accomplish the above. Bachelor’s degree from an accredited college or university in appropriate field of study is preferred but work experience is acceptable. Very comfortable with public speaking and cold call partnership cultivation. Proven ability to attract, train, supervise, and motivate potential mentors and mentees. How to apply: Please send a cover letter and resume to Deanna Mackey at the email address below. Contact: Deanna Mackey, President, Public Television Major Market Group & Founder of Public Media Women in Leadership, dmackey[at]ptmmg.org or 619-261-7002. (April 30, 2018) In the summer of 2018, Public Media Women in Leadership (PMWL) will launch the PMWL Mentorship & Engagement Initiative, a three-year program to provide one-on-one mentorship partnerships for women in public media and develop facilitated peer-group communities around job verticals (development, investigative journalists, digital staff, etc.) and leadership topics (confidence building, managing change, etc.). Funding for the initiative is being provided by the Wyncote Foundation whose mission is "To support efforts that strengthen and enrich culture, community and the natural environment." The Foundation has been active in supporting public media projects for many years ranging from system innovation to journalism and independent film. The Mentorship and Engagement Initiative has four components to provide mentoring, training and community for women in public media to both retain rising stars and prepare established leaders to attain the highest positions at stations and national organizations. The components are mentoring for women within five years of attaining a C-level position, mentoring for women in the first five years of their career, peer group facilitation and trainings via webinars and regional meetings and sessions at national conferences. Participation in the mentorship program will include monthly calls/meetings with a mentor, training via webinars and peer group facilitation, and community discussions via the Facebook page. There will also be opportunities for mentor /mentee meetups at the national conferences. The mentor partners will be required to work together for a minimum of six months. Curriculum and recommended topics of discussion will be provided, but the mentor /mentee partners also will have the freedom to dictate their own topics for discussion if preferred. The elements of the mentorship and engagement program were developed based on survey input from the members of PMWL, from results garnered from the group's pilot mentor program in 2015-2016 as well as learnings from the many webinars and conference sessions the organization has hosted. "I am thrilled that the Wyncote Foundation is investing in mentoring and training to build future women leaders for our industry," says Deanna Mackey, founder of Public Media Women in Leadership. "While women make up 51% of the population, they only fill about 25% of the GM/CEO positions at public media stations. As our country continues to diversify and increase its need for emotionally intelligent leaders, it's critical that our industry represents this in its leadership ranks. Our PMWL group currently has 1,700 members and the most common theme I hear from them is the need for career path training and mentorship. I could not be happier that PMWL and Wyncote Foundation will make this a reality for many women in our industry over the next three years." Beginning this month, the project will begin recruiting for a PMWL Mentoring & Engagement Coordinator position that will be responsible for managing the mentor program and peer group communities. As that position is being recruited, the PMWL will begin a call for mentors from throughout the public media system. Both men and women mentors are encouraged to apply and both mid-level managers and current and retired CEOs/COOs will be needed to serve as mentors for the two tiers of the project. The organization will also be looking for volunteers who want to lead the peer groups. Information about the mentor and peer group process will be available here on the PMWL website and the PMWL Facebook page (https: //www.facebook.com/groups / l 55843500773 l 899/) by late spring. Those who aren't yet members of the PMWL group can also request membership at the Face book group page. It is open to women working in public media. "Deanna and her colleagues have hit on a critical need in the system , and a creative way to assure rising leaders have access to seasoned guidance while bringing their own energy and perspectives to the system, " says David Haas, Vice Chair of Wyncote Foundation. "We believe this mentorship program will help supercharge an evolution in public broadcasting to an agile, forward-thinking system that reflects its audience." The Public Media Women in Leadership organization was founded in January 2015 by Deanna Mackey and Jeannie Ericson to provide a forum for women leaders and aspiring leaders to support and learn from each other, provide training and mentorship opportunities , build community and advocate for women leadership within public media. The PMWL currently has 1,700 active members in its Facebook Group and provides bi-monthly training webinars on both public media and leadership topics and leads sessions and socials at many of the public media national conferences. While Ericson has left public media, Mackey currently serves as president of the Public Television Major Market Group. Mackey is supported by a committee of current and retired women leaders in public media, many who joined as the organization was founded. The grant to fund the Mentoring & Engagement Initiative is being provided to the PTMMG on behalf of the Public Media Women in Leadership organization. Congratulations to Sarah Schaefer from KTOO, Juneau, Alaska on being the first Joanne Winik Public Media Women in Leadership Scholarship awardee. The committee members of Public Media Women in Leadership are pleased to announce the first five mentees of the group’s pilot mentorship program. The mentees were chosen from a pool of nearly 60 applicants and represent women from diverse backgrounds, a variety of disciplines and from stations around the country. The women were chosen based on applications they submitted that indicated their background in public media, experience in management and interest/aptitude for becoming a future general manager. The goal of the mentorship program is to better prepare women -- via mentoring and training – for GM/CEO and COO positions that open within the next five years. The mentor/mentee partners will sign a contract agreeing to meet once or twice a month for a minimum of six months and to participate in monthly webinars on topics about women in leadership and critical skill sets for public media management. The webinars will include presentations and input from current public media general managers. The Public Media Women in Leadership program was co-founded in January, 2015 by public media veterans Deanna Martin Mackey and Jeannie Ericson. The purpose of the group is threefold: establish a mentorship program to better prepare women with potential to become future CEOs/COOs in the system; create a community via Facebook and webinars/trainings to encourage conversation and sharing about issues related to women in leadership; and create awareness in the public media industry about the critical need to diversify station leadership. For more information about the program contact Deanna Mackey at 619-594-5499 or dmackey@kpbs.org.